East Borough lands on the Westside. John Cao and chef Chloe Tran’s Costa Mesa-based East Borough landed an expansive new location in Culver City last week. Facilitated by L.A.’s own Paul Hibler (Pitfire Artisan Pizza, Superba Snack Bar) and chef Jason Neroni (Superba Snack Bar), East Borough’s brand of “fraiche Vietnamese” adds some new Southeast Asian flavors to the Culver City restaurant mix. Tran’s interior design training helped create an amuse œil of a dining room that is visually inviting, exotic, and yet familiar. A mural covering an entire wall shows a frenetic Vietnam street scene during rush hour—something to which every Angeleno can relate. Comfort, however, is the focus here. Some of the soulful selections on the Culver City menu include Tran’s spring rolls, which were such a hit with her friends that she put them on the menu. Chef Neroni’s touch hits the menu in the form of a bowl of phocatini. It’s a soupless pho blending fresh bucatini pasta, braised oxtail, hoisin sauce, housemade Sriracha, crunchy bean sprouts, and herby Thai basil. 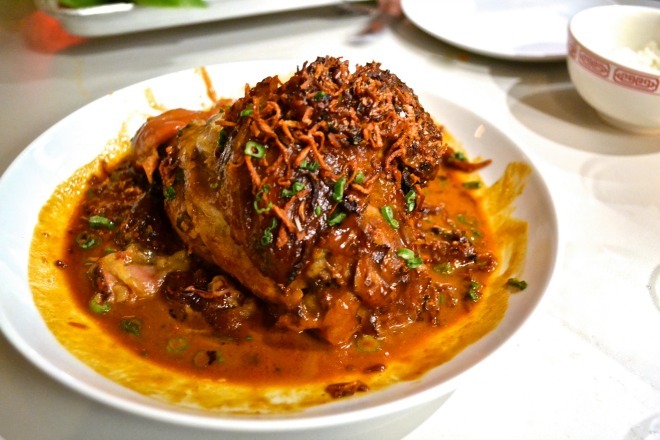 No doubt, the crème de la crème of the East Borough menu is heo, a tenderly braised pork shank cooked with dark soy sauce and rock sugar. The meat is chopstick tender, sweet, savory, and even creamy because of the softened fat layers and caramelized skin. The succulent skin is deliberately rendered slippery and slurps like a portly noodle when eaten. “This is how the Vietnamese like it,” explains Neroni. And this is how Culver City will like it too. East Borough, 9810 W. Washington Blvd., Culver City, 310-596-8266 or east-borough.com.